It has been seven years since our wedding vows. Nearly thirteen years since we first met. Which means we’ve been married for a little over half the time we’ve known each other. Crazy. Lately I’ve been thinking a lot about the first time we met. It was a chance encounter in a hallway at work. I instantly liked him but the timing wasn’t right. I found myself thinking “I hope I end up with someone like him one day,” and then was immediately struck by what an awkward thought that was, especially because I had a boyfriend at the time. He seemed so warm and friendly, and I wanted to stay talking in that hallway forever. Our paths didn’t cross again for at least a year when I switched projects. We were fast friends. Despite all the time we spent working together, and outside of work together as friends, it still took me another two years to finally work up the courage to let him know I liked him. And I only worked up the courage to tell him because I felt like the opportunity was going to slip away. Now, I can’t imagine how life could have turned out any differently! He is the perfect partner for me, whose strengths match my weaknesses. We are better people because we have each other in our lives. I can’t believe how lucky I am. I adore our life together, and the wonderful family we’ve created. I couldn’t ask for anything more. This year will see a lot of changes. Nicole is going to kindergarten, which means the kids will be in different locations during the day. There will be homework, and community volunteering. I continue to try and grow my business into something non-trivial so I can justify the time I spend home with the kids, which is becoming more and more of a necessity. Domingo has also been on more travel lately, and expects it to continue. Our move to the suburbs make all of these changes so much more tractable. I’m eager to see what this year brings. 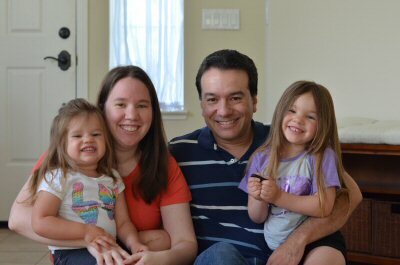 As two STEM parents, Domingo and I want to raise children strong in the sciences. To that end, we’re always looking at STEM toy recommendations online. Trouble is, I often disagree with what counts as a STEM toy. One list had My Pal, Violet as a “STEM” toy. It’s electronic, sure. But STEM? I just don’t see it. Here’s this data scientists pick for STEM toys for young kids. Building toys are the staple of any stem list. Everyone knows building blocks like legos are great for their budding engineer to learn spatial reasoning, and develop of love of design. Peg based connector toys (Lego, Duplo, Mega Blocks, etc) are great but why stop there? By varying the type of toy and how the pieces connect, you’re reinforcing the concepts by introducing new types of challenges, new ways to design and new ways of thinking to your little engineer. There’s magnet based connectors like Magformers and SmartMax. Gear connectors like Gears! Gears! Gears! is another fun one. You can also go with disc connectors like Brain Flakes and Mighty Molecules. A big hit in our home right now is Think n’ Link. To me a good STEM toy is one that gets a child interested in a STEM topic, and not necessarily building a critical STEM skill. If you don’t encourage kids’ interests they can sometimes fade. One way to do that is to include a plushy toy they can role play with. When the girls showed interest in space we encouraged it with a Curious George the Astronaut plushie and an Astronaut custom. We build rocket ships for George out of Mega Blocks. We noticed a similar impact with our Alexa. It sparked Nicole’s interest enough to get her thinking about robots. Even though it’s not a toy, we did get a STEM benefit from it. Anything that helps kids look at their world differently is going to help inspire them to think about their world in different ways. In this category I really like the Geosafari Miscroscope and Geosafari Kidnoculars. Both are designed well for little faces, and don’t require focusing which make them very easy to use. The binoculars in particular are a favorite because the rubber grip eye piece makes it super easy for even Alexis to use. We take our Binoculars (or nock-lers as Alexis calls them) to the Zoo and in the back yard. Even though they only have a 2x magnification, they proved a huge hit at the zoo. We were having an issue where Alexis would lose interest and want to move on to the next Animal before Nicole was ready. By introducing the Binoculars everything is new and interesting. If Alexis got bored with the Animals, she’d use her binoculars to people watch, or examine the trees giving Nicole all the time she needed. We’ve looked at all mannors of things though the Microscope, including our princess necklaces and bugs. My favorite thing to look at through the microscope, however, is cereal. You can see the holes in the rice krispies! Still dreaming, I opened my eyes. I’m in bed. It’s night. No, not quite. The faint light from the window indicates morning isn’t far away. What did I wake up? Was I dreaming? “Mommy!” The faint voice comes over the baby monitor again. Nope, wasn’t dreaming. I check my phone. 15 minutes before ‘wake up’ time. I get up and trudge down the hall. “Bunny asleep!” Alexis jesters to her sleep trainer clock. 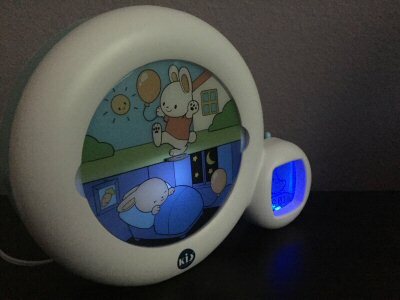 The bottom half of the clock, depicting a sleeping bunny, is illuminated, indicating it’s not time to wake up yet. “Alexis go back to sleep!” she states proudly with an implied ‘by myself!’ before laying back down in the crib herself. I love the bunny clocks. They helped both Nicole and Alexis through a few rough sleep patches. In both cases it seemed to curb the number of night time wakings, and help reduce the extra early mornings. I still remember one time I happen to check the baby monitor just as Nicole’s head was popping up from the pillow. She looked at the bunny, verified it was still sleeping, and lay back down. All by herself. The bunny doesn’t stop them from calling out if they need something – diaper change, potty, water, whatever – but it does seem to reduce the number of random wake ups that seem to happen for seemingly no reason. Occasionally the clock has back fired on us. Once Nicole came in our room distraught that the bunny had forgotten to wake up (she had just woken up extra early and was tired of waiting.) But, overall, it’s clear the bunny has had a positive effect on their sleep, and, by transitivity, on our sleep as well. One positive unintended consequence of the bunny clock? Explaining daylight savings time. Last fall we told the girls the bunny would be waking up later. This spring, we told them the bunny would be waking up extra early. When you’re two and three years old, the concept of a changing a clock’s time is rather abstract. At four, Nicole has a better understanding of daylight savings. It’s easy to just blame the bunny, though. The growth that I’m been experiencing of late, while awesome, has me a little nervous. It clearly can’t continue indefinitely. At some point the growth has to slow. The question I’m asking myself lately is, can I predict when? I need to get idea of how big the potential market is, and how big my share in it is. That’s easiest to do with the pregnancy verticals. For this analysis I’m sticking with US data, since 71% of my user base is located in the US according to Google Analytics. The birth rate in the US has been holding steady at just under 4 million the past couple of years. We might reasonably estimate that about 2.5% of expectant mothers don’t have internet access (1% of the 18-29 demographic, 4% of the 30-49 demographic). That would give us about 3.9 million potential users who may be interested in my pregnancy tools in the US. Diving into my usage logs, median access time into the Labor probability calculator is 20 days before the due date, with a standard deviation of 27 days. This indicates a period of about 1-2 months where pregnant women might be interested in when labor is likely to occur. Conservatively, let’s go with one month. Than in any given month we might expect a potentially interested audience in the US as 325,000. Last month I had just 5,000 from the US. That means I am capturing just 1.5% of the US market. What I don’t know is what percentage of those women would potentially care about labor probabilities. Statistics, in general, don’t appeal to everyone. I know they’re often met with skepticism when shared in the online forums. Recently one anonymous user described my Labor Probability Calculator as a random number generator. This is probably my fault for not making the mathematics behind the tool more apparent. Still, I get the feeling that a large percentage of the estimated “potential” audience would never be interested in my labor probability calculator, regardless. This miscarriage apps are more popular. Last month I had over 10,000 users from the US spread out over the miscarriage apps. There are a lot of unknowns when estimating the potential market here, as not everyone fears a miscarriage, and not everyone knows their pregnant early on, but I might estimate I have 3% of the maximum growth potential in the US. Again, before we factor out those who just aren’t into statistics. Of course this is ignoring other countries, as well as other none pregnant users, expectant fathers for example. So where would this put my potential growth overall? It’s still hard to say, since I need a way of predicting mathematical interest. I doubt there are enough expectant parents to carry the 30% growth trend into the fall. Wouldn’t it be cool if there were, though? February saw my highest per day rate of $3.44. It was also a shorter month, so the total of $94.95 was only my second best monthly total. Not exactly what I was hoping for, but I’ll take it. Users were up an insane 49%, and the trend line shows no sign of stopping. With the exception of the Saturday before the Superbowl I had over 1,000 users daily every day, including weekends. By the end of the month most week days were seeing nearly 2,000 users a day. The initial goal for February was additional content, but the site improvements appear to have greater return per effort spent. I did publish two new articles in How To and have two more coming. I also really need to create a site spell checker, which has been on my todo list, since creating the initial spell checker back in November. The big change to Datayze was an update to the miscarriage probability model. In my opinion, how I handled the update shows how far I’ve come. Back in 2015 I updated the, at the time, most popular app, the Readability Analyzer. I had been using a simplistic heuristic for counting syllables that tended to underestimate the number of syllables in a word. As a result, the Readability Analyzer was predicting slightly better reading ease scores than it should have. When I replaced the simplistic syllable counter for a more reasonable one the results were more accurate, but less desirable. My user base was upset. I got a number of angry emails about it, and more than one person vowed not to use it again since it wasn’t “stable”, despite this being the only change in nearly two decades. The user base fell 36%. At the time it was my most profitable app, so seeing those users flee was hard. Flash forward to a few weeks ago. I became aware of several large scale studies on miscarriage that tended to have higher per-week miscarriage incident rates than the current studies I was using in my model. They had a much larger participant pool. Excluding them from the model felt dishonest and would do everyone using my miscarriage apps a disservice. Adding them would once again create more accurate, but less desirable results. I was terrified that the change would kill my growth. I spent a week fine tuning my model. I knew there were many women who check the app daily, and would be shocked and alarmed that the probability of miscarriage was increasing. I wanted to be sure of my model before making the change. Then, as midnight Friday approached I made the push. I put a note explaining why the model had changed and stressed that I would be available for questions. Friday night I could not sleep. I checked my phone constantly for emails. The first came at 4:33 am. A few hours later news had spread to the forums. Normally I make it a policy never to interact when people share my apps in the forums unless they invite me to do so. (I don’t want to intrude, and I think it’s unprofessional to go around creating accounts on other sites just to respond to comments). This time, however, my apps that were intended to reduce stress were actually creating it. I felt compelled to reiterated why the change was made, and personally apologized to everyone who was negatively affected. The personal apology seemed to help, and so far there hasn’t been a mass exodus of any kind. It’s even possible that my stressing my commitment to model accuracy I may have helped my overall reputation. My goal for March is to finally get that Site Spell checker app up so I can use it. I want to improve the synonym list for the Word Analyzer, and see what it would take to get a better page speed score. It’s also time I start thinking more and more about my social media presence, and what it should look like.